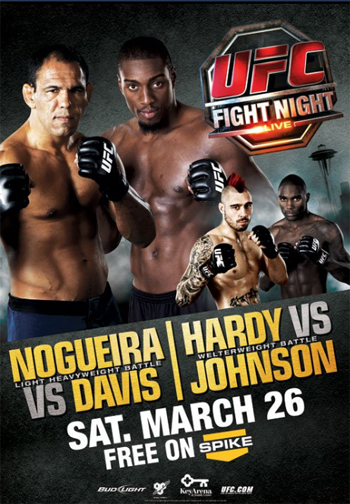 “UFC Fight Night 24: Nogueira vs. Davis” takes place Saturday night inside the Key Arena in Seattle, Washington. The first preliminary bout is scheduled to start at approximately 7:20PM ET/4:20PM PT. The UFC’s Facebook page kicks off tonight’s festivities with five live preliminary bouts at 7:30PM ET/4:30PM PT. The Spike TV broadcast air at 10PM ET/PT. Unfortunately, only fans with access to an east coast feed will be able to watch tonight’s main card live. A pivotal light heavyweight affair between Antonio Rogerio Nogueira and Phil Davis will headline the show.